There's a sad reality of workplace sexual harassment but what if it was taken to the extreme. Set against a backdrop resembling the case of ex-CEO of American Apparel Dov Charney, Unseamly, Oren Safdie's gripping drama at Urban Stages, tackles the story of a young girl seeking justice and retribution against the power-loving head of an infamous clothing company. But what if her tale doesn't actually line up and there is another side to the story? Malina walks into Adam's law office in hopes of filing a suit against Ira Slatsky, the head honcho of The Standard, after experiencing two years of empty promises, emotional manipulation, and sexual misconduct gone to the extreme. Through a series of active flashbacks chronicling the events in question, Adam must decide if it's worth taking on the corporate mammoth and at what cost. Unseamly is an action-packed battle of morality that showcases the consequences of temptation. Safdie’s he-said, she-said drama is magical. Just when you think you have it all figured out, he hurls a curveball that makes you suspect the truth and validity of the action presented by the characters. What Safdie does well is allowing Malina’s story to take precedence but having Ira’s recitation interject in a manner that keeps you guessing. Safdie’s subject is ambitious and likely to trigger emotions. But that’s what makes Unseamly so exciting. Safdie isn’t afraid to bring the story to the extreme in order for Malina’s tale to resonate. Safdie shows and tells the circumstances that Ira forced Malina in without fear. It allows the facts to line up for both Adam and the audience. There are clear objectives and desires in each of Safdie’s characters. They will fight to get what it best for them, even if it means manipulating the truth. By having three flawed characters, the action is even more enticing because you don’t know what they will do next. The subject of a man giving lacy lingerie, vibrators, and promised job growth may sound menial but watching a young woman decay just to keep her life afloat is the power that Safdie and the entire company bring. The entirety of the play is a battle to find the truth between Malina and Ira, yet there is great depth within the character of Adam. As the neutral character, it’s not until he breaks down that we see is true colors. Well, there’s also the end. With such a fervent button, Safdie gives us the answer to the mystery of Adam. And it’s a bit of a let down. Let ambiguity shine! If this is an integral moment, finding the middle ground between answer and vagueness will leave the audience rightly satisfied. The cast of Unseamly is stellar. The unity between the trio is what makes this piece tick. The subject is not easy and the intensities that Safdie and director Sarah C. Carlsen ask their company to go requires great trust. And this company had that. Bound by naivety, Gizel Jimenez’s Malina was a mesmerizing. Jimenez as Malina is engulfed in a trap of fast-talking men yet manages to put up a fight. Jimenez went the distance, tapping into a world of emotions, bringing out some captivating moments. There was passion inside that kept the story moving. As seedy Ira, Jonathan Silver conveyed a character that you should naturally despise yet Silver was endearing. What’s so appreciative about Silver’s performance is the detail in which in put into the character. The specificity of cadence was clear and telling. When Ira was talking fast, there was falseness but the moments he slowed down and carefully chose his words, that’s when Ira drew you in. Taking on the lawyer, Tommy Schrider was much more than just an active listener. Schrider’s Adam went through inner turmoil, deciding whether his own morals or job security was more important was equally was captivating. Rather than keep things simple, director Sarah C. Carlsen put her foot on the gas on revved up the speed. The structure of Safdie’s script was consistently moving and Carlsen kept the velocity up. The fluidity in her staging was strong, using a less is more philosophy and expertly maneuvering the secret-filled cube-inspired set by Brian Dudkiewicz. Dudkiewicz’s grey cube was the perfect screen for Nicholas Blade Guldner’s energized video design. While mostly relegated to the preshow, Guldner’s design was evocative and set the right tone. The score by Krystle Henniger was reminiscent of a triumphant movie soundtrack with its highs and lows. 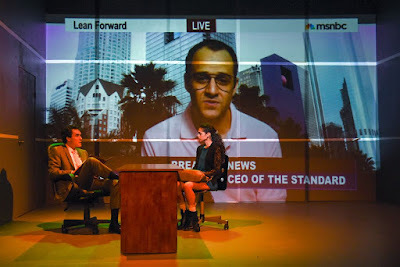 Though it felt bigger than it appeared, the cube set didn’t allow for much isolation but lighting designer Christina Watanabe played around with color and moods, discovering a way to theatrically keep Adam present in the play but not in the scene. Unseamly is a winning production from start to finish. Oren Safdie’s topical tale is haunting and more thrilling than the endless news cycles that inspired it.